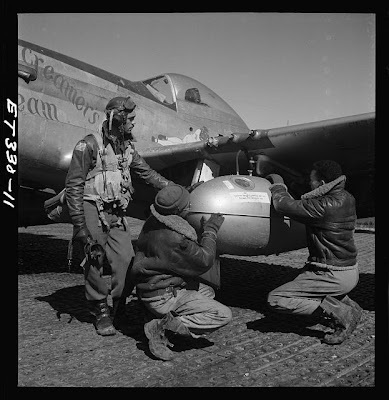 Group of Tuskegee Airmen with a P-40 airplane. An Airman checks 50-cal. 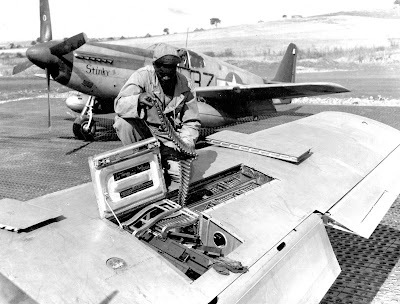 machine gun ammunition in a P-51. 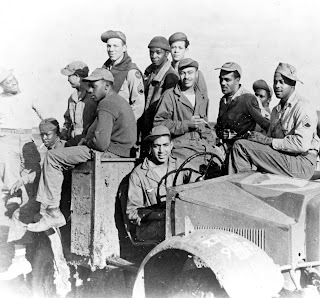 Part of the 99th Fighter Squadron ground crews in Sicily, during WWII. 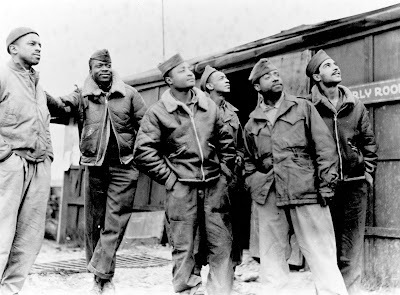 A group of Tuskegee Airmen, at Rametelli, Italy, March 1945. Photo courtesy of Library of Congress. Photo details. Tuskegee Airmen getting a plane ready for action, at Rametelli, Italy, March 1945. In commemoration of Black History Month, Americans of all races should honor the achievements of African-American servicemen and women, especially those who gave up their lives in service to their country. We can do this by making sure the Government begins to spend a sufficient amount of money to recover the remains of our missing in action, many of whom were African-Americans, such as the following 29 MIA Tuskegee Airmen of World War II (whose stories were documented not long ago in a series of articles in the St. Louis Post-Dispatch): Lt. Albert L. Young, F/O Carl J. Woods, Lt. William F. Williams Jr., Lt.Sherman H. White Jr., Lt. James R. Polkinghorne, F/O Leland H. Pennington, Lt. Andrew D. Marshall, Captain Andrew Maples Jr., Lt. Oscar D. Hutton Jr., Lt. Wellington G. Irving, Lt. Fred L. Brewer Jr., Lt. John H. Chavis, Capt. Alfonza W. Davis, Capt. 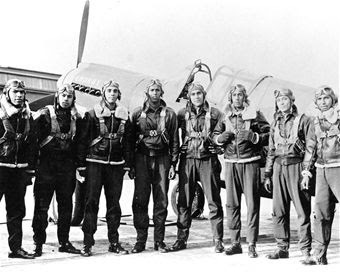 Lawrence E. Dickson, Lt. Maurice V. Esters, Lt. Samuel J. Foreman, Lt. Frederick D. Funderburg Jr., Lt. Samuel Jefferson, Lt. Charles B. Johnson, 2nd Lt. James L. McCullin, Capt. Robert B. Tresville, 2nd Lt. Elton H. Nightingale, Lt. George T. McCrumby, 2nd Lt. Thomas C. Street, 1st Lt. Langdon E. Johnson, 2nd Lt. Ferrier H. White, 2nd Lt. Harry J. Daniels, 1st Lt. John H. Prowell, and Lt. Samuel G. Leftenant. The Defense Department has historically treated its MIA remains recovery program like a neglected stepchild, requesting a level of funding that is nowhere near the amount needed to recover the remains of the tens of thousands still missing. 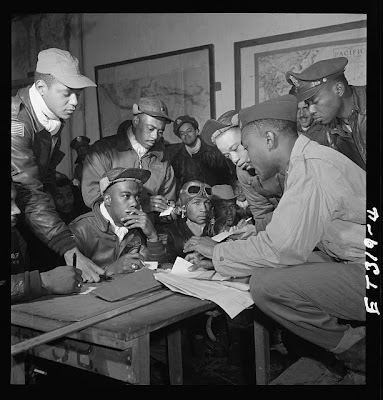 Please support substantially increased funding for location and recovery of the remains of our heroic missing Tuskegee Airmen, and all the other missing soldiers, sailors, and airmen of all ethnicities. Their sacrifice and their families deserve nothing less.